Aha! is a remarkable software tool that has been created specifically for product managers. First released in 2013, it supports today a broad range of activities that are “core” for software product managers according to the ISPMA reference framework. In recent years I observed a trend towards higher-level planning capabilities for product managers in the tool landscape. 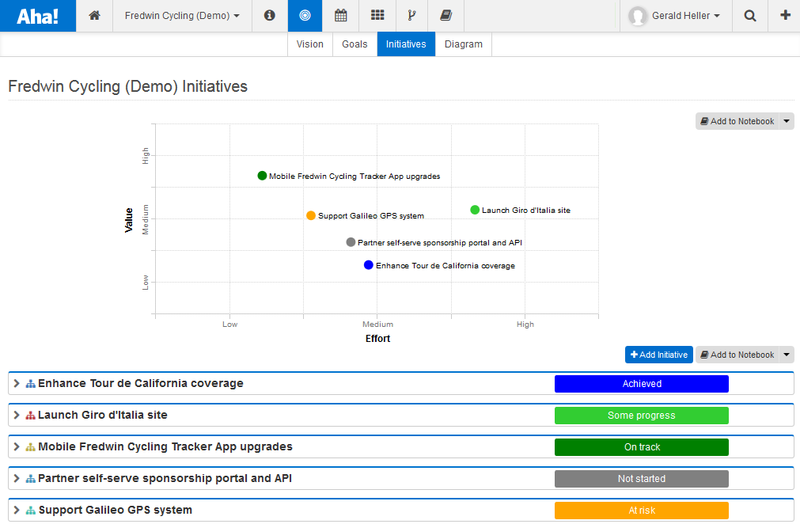 On the one hand, a couple of existing tools for agile project planning and application lifecycle management have gotten capabilities like roadmapping and release planning. Prominent examples here are VersionOne and HPE Agile Manager. In this article, I’m reviewing Aha!, since it is the tool that provides the most comprehensive support for software product managers today. One of the unique capabilities of Aha! is the way how it supports product managers to translate business/product strategy into more detailed product plans. Aha! is a cloud-based product planning tool from a company by the same name that was founded in 2013 by Brian de Haaf and Dr. Chris Waters. I came across this tool in 2014 and described my first impressions in a blog article at MakingOfSoftware.com. Since then, many capabilities in the area of product strategy and product planning have been added to Aha!. Have a look at the impressive release list. This blog article sheds a light on some of the most important capabilities. Aha! allows to connect strategic business goals with detailed product plans. By utilizing the central repository of Aha!, product managers can keep relevant strategic information in the same place as the more detailed planning information. Aspects of the business strategy are captured in Aha! using the business model builder capability. The business model builder is delivered with a preconfigured a set of components that represent elements of a business strategy, such as vision, customer challenge, positioning, market, competitors, and personas. Figure: Strategy components in Aha! The figure above shows the standard Aha! 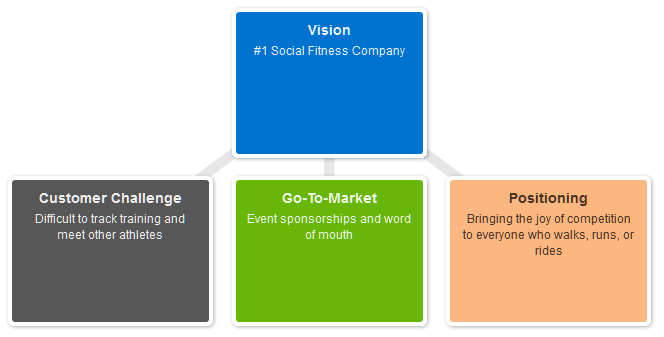 strategy components within the business model builder. Product managers may use these standard components or even define additional components relevant to their business model. For example, using this flexibility it would be easy to configure a set of business strategy elements that reflect the elements of the business model canvas model proposed by Alex Osterwalder. The figure above shows the standard Aha! strategy components within the business model builder. It shows an example of visualizing a product strategy. Product managers can create additional, more detailed views of the product strategy by adding other components of the business builder to a specific view. Once the business model is defined, product managers need to translate the strategy onto a timeline. Aha! supports this translation through the planning elements Goals, Initiatives and Roadmaps. Roadmaps in Aha! are available on different levels of granularities. They may be focusing on strategy, releases, or features. Depending on those levels, granularity of information and visual representation will be different. 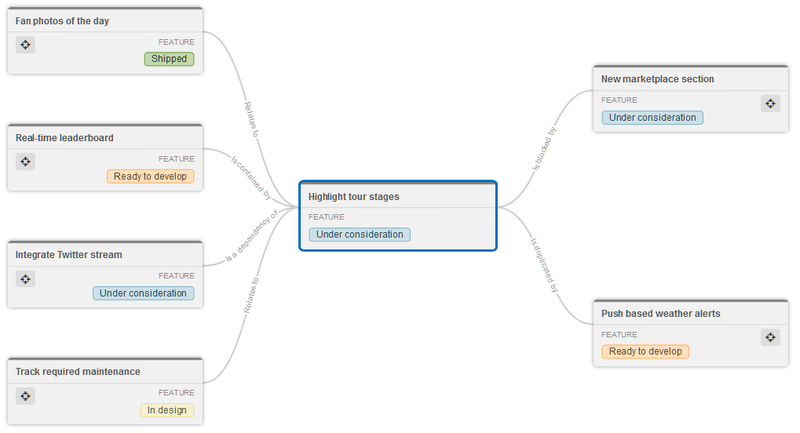 The visual representation of those roadmaps is highly configurable. In the figure the additional information about initiatives has been chosen to be displayed along with the target time frames. Roadmap communication depends on the target audience. Product managers will share more detailed roadmap information with internal audiences, whereas they might provide only high-level information to partners, analysts and key customers. Aha! 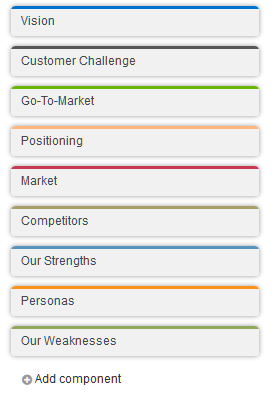 accommodates these needs by providing a variety of filter settings for roadmaps. Creating different roadmap views from the same underlying repository has two major advantages: different roadmaps for different audiences are guaranteed to be consistent, and it is less work to incorporate changes consistently across the different roadmap views. Roadmap publishing is supported as well: Aha! 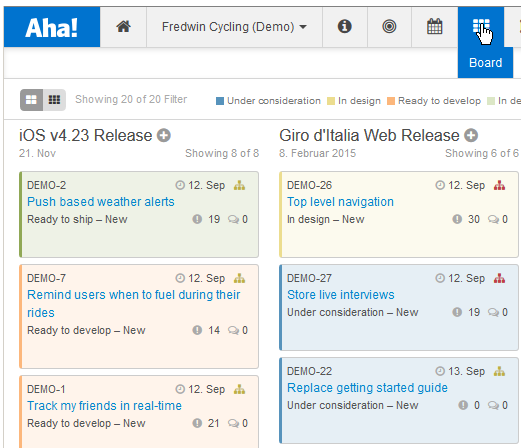 provides secured web spaces for online communication of product roadmaps, called “notebooks”. Notebooks can be shared either publicly or within the Aha! user community. Other output format of roadmaps are PDF and PNG. Given the fact that today’s number one roadmapping tool is PowerPoint® PNG is useful. However, the capability to directly generate or update PowerPoint® slides would be even more helpful. Managing a single product is already complex. However, the situation is getting worse when managing a portfolio of products, and that is a challenge many product managers face. When managing a product portfolio, activities need to be streamlined and synchronized across several products. This is often called an initiative. Initiatives are activities that apply not only to a single product but to a set of products, for example rolling out all the products on a new platform. Aha! provides capabilities to define and track initiatives across products. Initiatives can be connected to product lines, products, releases and features. A product manager can filter on initiatives. She can also decide to include such information on roadmaps or not. This capability within Aha! addresses some aspects of portfolio management functionality in the tool which is useful for many product managers. Features are the primary elements for release planning in Aha!. Features may hold numerous attributes that describe them in detail, e.g. description, originating source, effort, etc. Aha! allows to add custom attributes to feature cards. In addition the appearance of feature cards can be fully customized. In the board view, Aha! displays planned releases and their associated features nicely side-by-side. Features can be further detailed by attaching requirements to them. However, the creators of Aha! draw a clear-cut here. Aha! is not a requirements management tool. Therefore, only limited support for requirements is provided within Aha!. However, synchronization with requirements management tools is offered. One of the most prominent examples for tool integrations is Atlassian JIRA. Aha! allows to synchronize requirements back and forth between Aha! and JIRA. Product features are frequently dependent on other features. From a planning perspective, it is a good idea to manage and visualize such dependencies. Good requirements management tools typically offer these capabilities under the term traceability. Aha!’s product team had gotten numerous requests to offer product capabilities that allow dependency management. In November 2016, a feature dependency map got released that does not only nicely visualize dependencies, but also allows to modify objects directly within this view. Allowing direct editing within such a map is technically quite advanced. It surpasses most similar solutions in traditional requirements tools. Currently, Aha! lists 24 tool integrations on its website. Tool categories range from issue tracking, project management, team communication, customer relationship management, to development environments. Within the Enterprise+ edition Aha! allows to extend the data model with custom tables. This way customer can add company specific data elements to complement the data managed out-of-the-box by Aha!. This company specific data can then be linked to other data elements of Aha! like goals, initiatives, and features. Aha! lists as a typical example custom tables that represent customer information relevant for product planning. Aha! is delivered as a cloud solution today. For some companies this might not be acceptable because business model and product plans are highly sensitive. An on-premise solution would be an option to address this. While Aha! delivers a quite impressive set of capabilities today, there will always be aspects that users ask for in addition. Whether these will be addressed in the future depends on Aha!’s own vision and roadmap. One area of particular interest is the planned product scope: which new new functionality will be added directly to the tool vs. features that will rely on integration with other products. With Aha! product managers get a rich toolset at hand to manage product strategy and resulting product plans at a single location. This unique combination of capabilities positions Aha! as one of the most comprehensive tools for product managers today. I’m Gerald Heller, and I’m a partner at pd7.group. We provide training and consulting in the area of software product management. One of our specialties is supporting organizations in selecting and customizing tools that support product managers and help them collaborate with other functions. We always love to hear about customer experiences with tools like Aha!. Contact me if that’s a topic you are interested in.